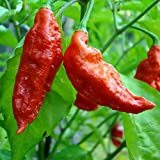 Bhut Jolokia Chile Pepper 4 Live Plants - 2" Pots - Ghost Pepper - Flaming Hot! 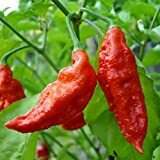 Ghost pepper for sale is available in bare root form. Rated as the hottest pepper in the world, ghost pepper is best planted in areas with at least 5 months (140+ days) of hot weather in order to succeed and will not tolerate any temperatures below 70° F.
They are not a particularly easy plant to grow and conditions need to greatly mimic their natural environment of northern India to have any chance of success. 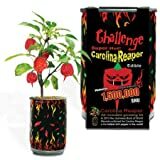 Growing ghost peppers may take up to 150 days to mature and bear fruit. Location – Choose an area in your garden that receives as much sunlight as possible. An environment with 70% humidity is ideal for growing ghost peppers. You can also plant them indoors as long as the ideal conditions are met. Make sure the peppers are grown in a spot with good air circulation and spaced properly. In addition, grow your peppers near lots of flowering plants to attract pollinators. The pepper plants themselves grow up to 4 feet high and will do well when they are at least 36 inches apart from each other in the ground. Soil – Ghost peppers need light, well-draining soil such as a peat-based soil. Avoid using heavy clay and potting mix. Soil pH must be 6.0 – 6.8. Raised beds or large containers are ideal for ghost peppers since the soil will be much warmer. You may need to add organic matter to the soil especially if you are working on sandy soils. Add a few inches of organic mulch, like wood chips, straw or leaf debris. This will keep weeds down while also keeping the soil warm and moist. Water – Maintain a regular watering regime to avoid shocking the delicate peppers. Give them a good long soak twice per week during dry spells. It is best to water at the base of the plant in early morning to avoid fostering molds and other diseases. These peppers are sensitive to too much hydration like most hot peppers. You may use a moisture meter to check the water level. Fertilizer – Fertilize the newly planted ghost pepper plants with a well-balanced, organic fertilizer or compost tea. Avoid high nitrogen fertilizers because it creates lush foliage but produces poor quality peppers. 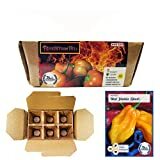 Feed your ghost peppers 2 or 3 more times during the growing season. Alternatively, use a controlled release fertilizer to feed during the whole growing season. Harvesting – When harvesting ghost peppers, you might want to wear gloves to prevent any burns from it. Ripe peppers will be 1 1/2 to 2 1/2 inches long. Pick the fruit when it is firm and brilliantly red in color. Avoid contact with the face or eyes. You can eat or prepare them fresh or dry them out. They tend to be even more potent if dried before consuming. You can use a dehydrator or set them on a wire rack at a very low setting in your oven. Freezing the peppers allows you to preserve the garden-fresh flavor.